I was reading a blog recently written by an obviously conservative Mormon opining about illegal aliens. His position was that the Mormon Church was right to influence Utah politics regarding the Utah Compact and the state guest worker program because it was a moral issue. It got me thinking about the many facets of morality that come into play here. First, I think any discussion about illegal aliens and morality must begin with the poster child used in the discussion. When advocates for amnesty make their pitch it isn’t long before they portray a man and his wife with children in tow crossing the desert in darkness. They are fleeing a cruel existence in search of a better life. All he wants to do is feed his children. What a nice sentiment. Unfortunately, the demographics he portrays simply aren’t there. 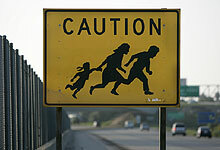 In June of 2005, Pew Hispanic Center issued a report about the characteristics of illegal aliens. Only 17% of their families consisted of non-citizen children. 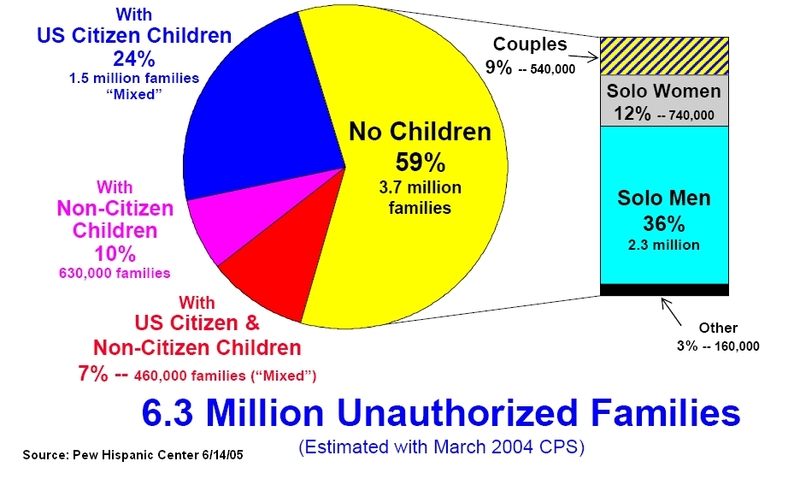 83% had no children at all when they came to the United States illegally. The largest cohort was single men at 36% of all illegal alien families! That squares with the videos we see of young men crossing over the border with their backpacks. It doesn’t preclude the fact that those people begin having children once they get here. The demographics reveal that the fertility rate of foreign-born jumps when they live in the United States. For example, in Mexico the fertility rate is 2.4. A Mexican woman living in the USA boosts that figure to 3.5. So, the premise is all wrong. They aren’t families fleeing the horrors of the third world. They are young, single adults coming here to make money. Worse, they are ill-prepared. Few of them have adequate schooling or skills to contribute to society. In essence, we are importing high school drop-outs. And their behavior is not unpredictable. A friend who is an LPR from Venezuela has worked alongside illegal aliens for 15 years. He explains that the family men are hard workers. They don’t want any trouble. But the single guys are the worst. They drink too much, goof off and have trouble showing up on Mondays. But the meme is that they are all hard working family men who came here fore a better life and are diligently doing the work our own citizens will not. With a clearer understanding of the people we are talking about, let us proceed by talking about the morality of fairness. Surely we can agree that from the lofty view of religion they ought to speak out against the lack of fairness when they see it. That’s the moral high ground, to demand the world that ought to be by exposing the inequities. When an illegal alien goes to work in the United States he is typically young, unskilled, uneducated and working for less money than a person with the legal right to work here. He is also less likely to have benefits and more likely to skirt the tax laws. It is not disputed that this competition tends to lower wages and benefits for all workers. Simply put, if an employer can get away with lower labor costs he will. So, who are the victims in such a scenario? The most vulnerable of our own. They are the adults with little education and low skills who need a job. And the notion that there are jobs Americans won’t do is hogwash. The truth is Americans are doing those jobs every day. The truth is more of them would do those jobs if the wages weren’t artificially depressed by illegal aliens in the workplace. I might add that there isn’t a labor shortage. Even before the recession of 2008 there were plenty of people who needed work. According to the March 2007 US Census data there were 6.8 million illegal aliens working in the United States. At the same time there were over 32 million Americans with low skill sets needing jobs. So, where is the morality in that? How can it possibly be considered the moral high ground to steal jobs from our own? How can someone who has broken the law to come here and then entered our labor force through fraudulent means have any claim on decency? And why would a church defend such a person, knowing that people who have broken no laws NEED those same jobs? Further, why would a church endorse a program to legalize those same workers? Would it not be ethical to ask those workers to step aside? Would it not be right to demand that employers follow the law of the land? Would it not be more ethical to put our own people to work? While on the subject of fairness, it needs to be pointed out that our social safety net is stressed. There simply is not enough to go around. And yet, we are importing needy people through both legal and illegal means. On the most blatant level, there are children being excluded from benefit programs because their identity has been stolen and used by aliens to work illegally in the United States. An audit in Utah alone places that number at 50,000 children. But even without the ID theft problem, there are finite resources at stake. Schools, clinics and welfare offices are providing services to illegal aliens and their families. How is that fair to those who need those resources but cannot get them because the demand is artificially high? We would do well to remember that every time we say “yes” to someone here illegally, we are in effect saying “no” to a needy citizen. The very existence of illegal aliens in our society makes all of us participants in this form of slavery. And for what? …a $2 savings on a meal at a restaurant? …or $5 less for a hotel room? …or a $300 discount on a new roof? … or a year of lawn care for $60 less? Somehow that brand of morality rings hollow to me. It is not morally correct to give away what does not belong to you. To be sure, any church with a global mission sees itself as an international institution. Despite their origins the Catholic Church is more than just the Italian Church, the Mormon Church is not the Utah Church, the Lutheran not the German Church…and so forth. Notwithstanding the Biblical edict to “teach all nations” churches must abide by the laws of the land unless they take up swords and crusade their way across the borders. The endorsement of amnesty by churches seeks to give away what is not theirs to give. They may sponsor immigrants. They may pay for their immigration paperwork. But they may not give away sovereignty, for it does not belong to them. Furthermore, the position taken by churches tends to foment anarchy as others are embolden by these institutional endorsements of unlawful presence. Parenthetically, when a group advocates transforming the lawless into law-abiding through edict, that does not settle the question. It merely emboldens another wave to hunker down and wait for amnesty.